Plug your PC power cord into the top control outlet of the Mini Power Minder and then connect a peripheral or a power strip to the lower outlet. Many computer peripherals use power even when they are turned off. 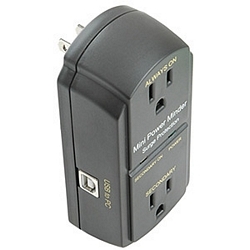 The Mini Power Minder communicates with your PC via USB so when you start up or shutdown your computer, power to the secondary outlet starts or terminates at the same time. You'll control all your peripherals in one easy step! To control multiple devices, plug a power strip into the secondary socket and use it as an extension for several devices. Note: for full functionality, the Mini Power Minder requires being attached to a PC that disconnects power to its USB ports when off.